This will be a People’s Assembly on the Steps of the Federal Hall Memorial Building, the birthplace of the Bill of Rights. It will begin with a few guest speakers (some people you may know!) and then we will open up stack for participation from the body of the assembly. We are inviting people who wish to participate to bring a 2 – 3 minute grievance. We will be using the people’s mic. Take some time, write it out, don’t worry if there are too many, we can do this every week Make a list or delve into one area more in depth. The next Town Square will be in Manhattan on Saturday, April 28th. 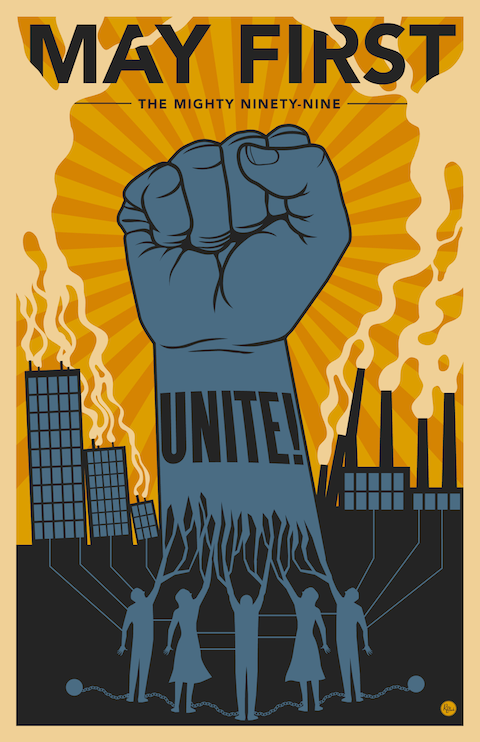 On May 1st workers, students, immigrants, and the unemployed from over 120 U.S. cities will stand together for economic justice. On Saturday, April 28th join us first at 12pm in Bryant Park, where we will parade through mid- town to get word out about the General Strike. Then from 2pm in Union Sq we will prepare for the big day with many trainings, teach-ins and skill shares. We will be running an Open Space, so you can just show up and run activity, but if you'd like to sign up and let us know you're coming, the link is here: http://tinyurl.com/ots5signup. You can also sign up on Facebook and follow @OccupyTownSq! Thousands of protesters have descended on the General Electric shareholders meeting in Detroit for the second day, including members of Occupy Detroit, unions, and activists from 99% Power, a new coalition of labor, immigrant, and community groups. On Tuesday, protestors successfully disrupted GE CEO Jeff Immelt's speech to demand GE pay the over $26 billion in back taxes they owed. Today, as protesters massed outside, large numbers of shareholders sympathetic to Occupy chanted ¨pay your fair share¨ inside the meeting itself. Today's action in Detroit comes after yesterday's shutdown of a Wells Fargo shareholder meeting by at least 2,000 activists from Occupy San Francisco and 99% Power. 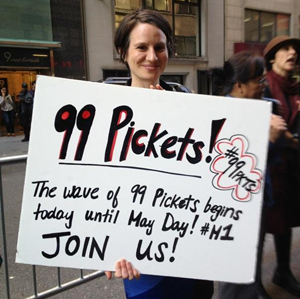 This upswing in action can mean only one thing: May Day is coming. Keep reading for details on Detroit's plans for May 1st. ACT UP is calling for a small tax (0.05%) on Wall Street transactions and speculative trades in order to raise the money needed to end the global AIDS epidemic and provide universal healthcare in the US. Reverend Billy Talen, Rebel Diaz, and Occupy Wall Street's own Capoiera troupe will be performing while an ‘exorcism’ on student loan debt takes place on the steps of Boylan Hall. On April 25th the total amount of student loan debt in the U.S. is due to top 1 trillion dollars. This marks a momentous victory for Wall Street, and the Occupy Student Debt Campaign has organized a national day of protest in response. Join us as we march to Wall Street to help the banksters celebrate their achievement. The May Day logistical and outreach clusters meet in a spokescouncil format to report back on their efforts. Afterwards, we discuss the proposals brought forth in the spokescouncil in a discussion open to all.